The MIC2860-2D is a high efficiency White LED (WLED) driver designed to drive two WLEDs and greatly extend battery life for portable display backlighting, and keypad backlighting in low cost mobile devices. 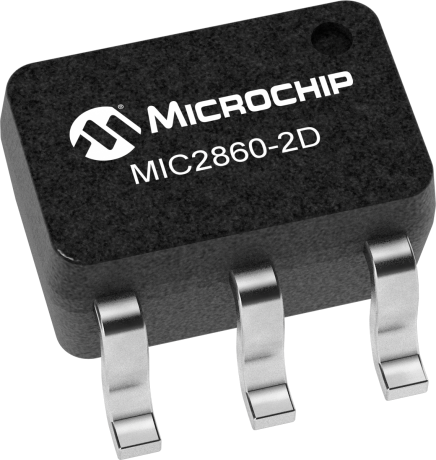 The MIC2860-2D architecture provides the highest possible efficiency by eliminating switching losses present in traditional charge pumps or inductive boost circuits. It features a typical dropout of 52mV at 30.2mA per channel. This allows the WLEDs to be driven directly from the battery eliminating switching noise and losses present with the use of boost circuitry. The two channels have better than ±0.5% matching, which helps ensure uniform display illumination under all conditions. The WLEDs brightness is externally preset by a resistor and dimmed using a single wire digital control signal. The MIC2860-2D single wire digital interface accepts digital programming pulses providing 32 dimming steps. The MIC2860-2D is available in Thin SOT-23 and SC-70 6-pin packages with a junction temperature range of -40°C to +125°C. MIC2860-D - High Efficiency 2 Channel WLED Driver with Single Wire Dig. Cont.